Please contact Udo Middelmann via e-mail udodebch@aol for a copy of the latest Francis A. Schaeffer Foundation speaking engagement schedule. Few Christians have had as great an impact on their generation as Dr. Francis A. Schaeffer. He communicated the truth of historic Biblical Christianity in a way that combined intellectual integrity, artistic sensitivity and a practical loving care. With a sharpened analytical mind he understood and uncovered the roots of modern thinking and its logical conclusion across a wide range of disciplines. In contrast to other worldviews and religions Christianity can stand truthfully, addressing our need to understand reality with our minds, to cope with it in our lives and to work into it with reasonable hope. The Francis A. Schaeffer Foundation was incorporated in 1988 by Edith Schaeffer, Udo and Deborah Middelmann and several of their friends as a foundation of ideas. 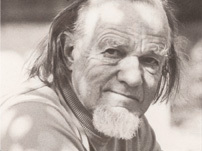 It attempts to serve as a resource to others and to advance the availability of Francis Schaeffer's ideas. Written, taped and filmed materials are a help to interested people, individuals or organizations, around the world. Much more than in organizational structures Schaeffer believed in the power of ideas and pointed out how cultures as well as individuals live with the consequences of their worldview. Schaeffer saw the Christian worldview as the only way to understand our existence in the world around us, with nobility for all human beings, with real answers to the tough questions of life and death and with a coherent singular purpose to fulfil the mandates of God, who has made us in his image. The Francis A. Schaeffer Foundation seeks to fulfil its purpose in various ways detailed on other pages. Study programs, lecture series, seminars, FOOTNOTES publication and background materials, correspondence and notes from Dr. Schaeffer's life and work are several valuable ways by which the Foundation makes a contribution to a wider discussion of the truth of Biblical thought and life. The Foundation wishes to render a service by contributing more Biblical insights into current philosophical, ethical and cultural reflections. The Foundation is incorporated as a 501 (c) (3) not-for-profit organization and depends for its continuing work on gifts and contributions from friends and donors. Who was Dr. Francis A. Schaeffer? The unique contribution of Dr. Francis Schaeffer on a whole generation was the ability to communicate the truth of historic Biblical Christianity in a way that combined intellectual integrity with practical, loving care. This grew out of his extensive understanding of the Bible from a deep commitment to Jesus Christ as his Lord and Savior and a critical study of the world of man. These two pillars supported his inquisitive and analytical mind on the solid reality of the truth of God's creation and of his revelation. He understood the roots of modern thinking in its rejection of reality and rationality and pointed out the logical conclusions in a wide range of disciplines and in society. Dr. Schaeffer understood that what a person believes influences the way he acts in history and individual situations. There is a relationship between a person's view of truth and life, between philosophy and practice, between faulty ideas and foolish choices. Dr. Schaeffer discussed the truth of reality with anyone in many settings. This in turn brought students, professionals, scholars and others from around the world to his home to learn from his insights. They returned with them to their own world and applied them to their circle of life and work. The ideas continue to bear fruit and to stimulate discussions and discoveries through more than 25 books, several films, taped seminars and lectures at leading universities in Europe, the US and abroad. The result has been a profound and enduring impact upon many thousands who have then gone to make their own mark in history. The central thrust of Dr. Schaeffer's teaching is that Biblical Christianity is the truth about the real world. The only reason to be a Christian is an acknowledgment of what is objectively true about human beings, the real world and the basic human predicaments. The Bible is true in all that it affirms. This emphasis is not so much the summary of academic instructions or doctrinal positions. It is the result of a searching mind, of being exposed to human history, the European culture and art, and of in-depth discussions with knowledgeable people for a lifetime of study, observation and work. With the Bible as his base and a profound interest in human beings, Dr. Schaeffer's insights were developed through the experience of the Rijksmuseum in Amsterdam, the study of Florentine society and art, in lectures followed by tough discussions at modern Cambridge, in rude exposure to the slums of Bombay and in probing questions of people from a great variety of backgrounds, in abortion protests, in response to life in the wider arena of human need and pervasive intellectual confusion in our world.